Velvety turkish ice cream kept things cool with a show on Sunday, Oct. 11. Takoyaki from Japan offered octopus-filled fried dumplings topped with wiggling bonito flakes. Cooking up takoyaki behind the scenes. Live weaving projects demonstrated the craftsmanship of cultural textiles. This part-finished rug showed the process of making an intricate piece like this. Curry goat and carrot juice offered the flavors of Jamaica. Boba-filled tea cooled down attendees on the hot sunny, day. It may not be the most exotic, but freshly roasted corn was pretty irresistible. 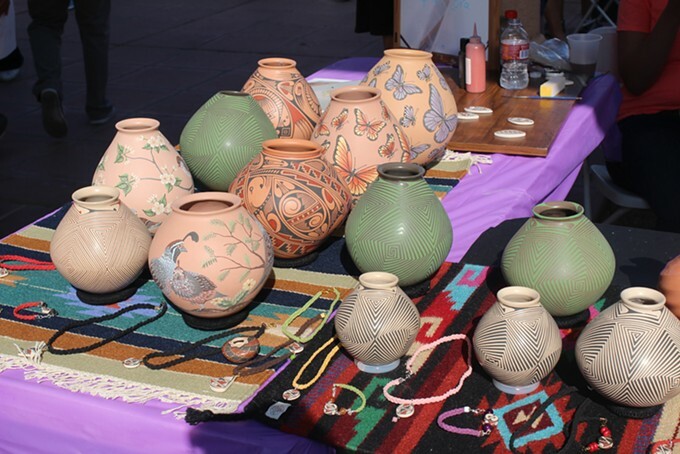 Many vendors brought handmade pottery to Tucson Meet Yourself. Outside, the bao was light and fluffy. Inside, the bao was filled with tender, flavorful char siu pork. Simply named "meat stick," this Vietnamese take on barbecue stood out with an explosively flavorful marinade. Bright, colorful crepe paper flower showed off some of the beauty of Mexican crafts. 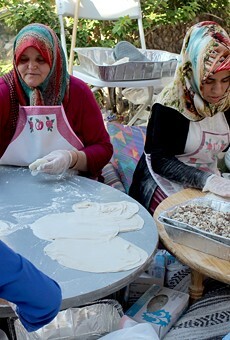 A group of women expertly rolled out Turkish bread to be cooked over a live fire. Soul food showed up in the form of mac and cheese, fried catfish and peach cobbler. Craftsman meticulously handpainted plates in front of crowds. The Costa Rican chicken tamal had rice, olives, chick peas, carrots and peppers studded into the soft masa. The Friends of Tucson's Birthplace offered some knowledge on heirloom plantlife in Tucson. Ranching is definitely a part of Tucson's past and present and this handmade rope display showcased that. This Filipino turon may not look like much, but inside the crunchy egg roll wrapped sat a melty, hot banana covered in cinnamon sugar. Attendees enjoyed piping hot paella. Crispy Polish potato pancakes were served with apple sauce and sour cream. Many stands offered their take on the barbecue, including this grilled chicken from Laos.